No, I’m not planning to entertain any animals; my house is too small. 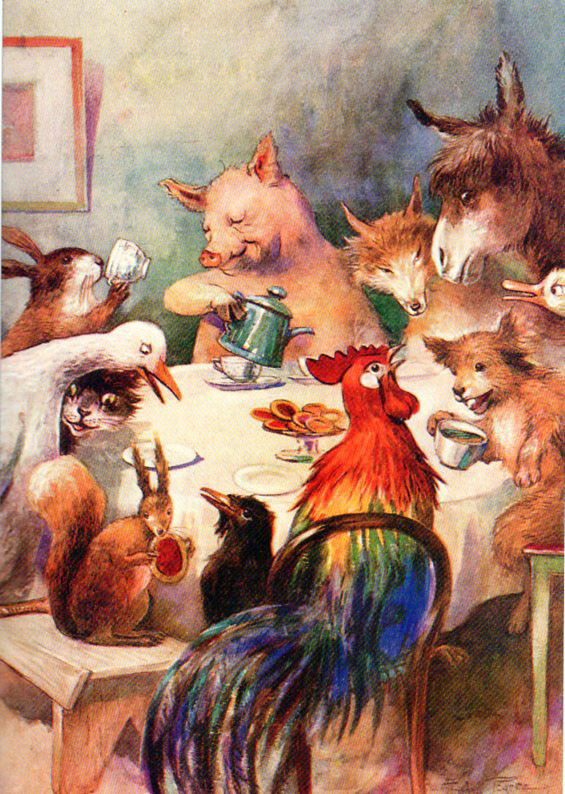 However I do have a small collection of vintage sourced images of animals entertaining themselves. They seem pretty darn good at it too. 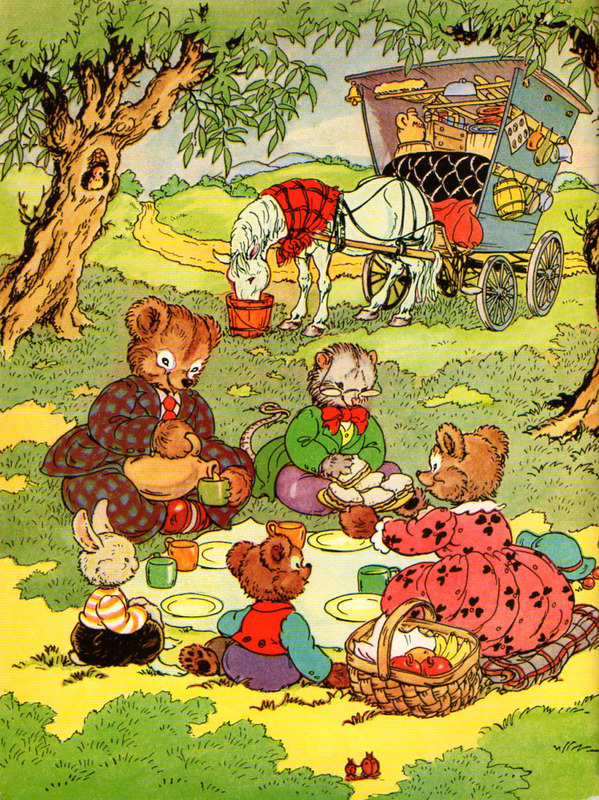 The bright flat area colors and simple outlines of this picnic scene rescue it from being overly precious. The interesting (almost faerie-ish) tree and the old-fashioned peddlers wagon are great elements in themselves but in the case of this image they also serve to contain the scene; giving it an intimacy of setting that it would not otherwise have. One of the best parts of an outdoor summer party is the dancing. 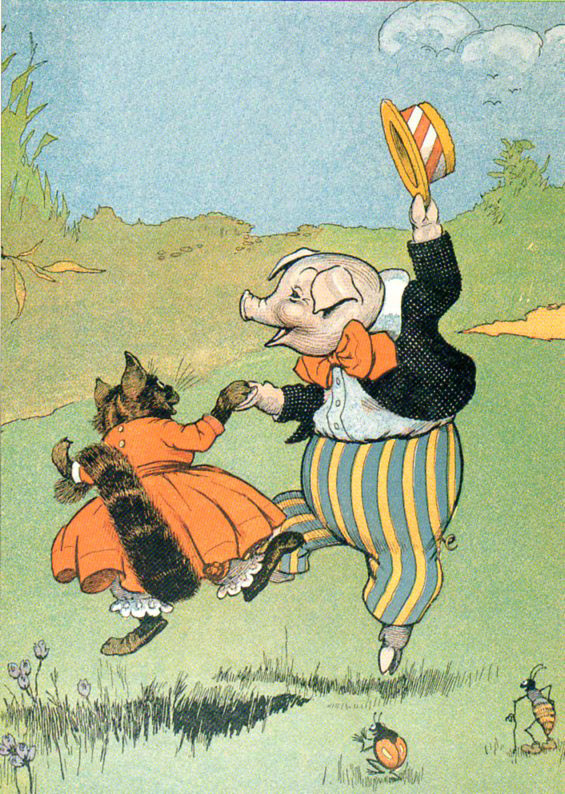 That pig is a snappy dresser and the cat is exceedingly light on her feet. Please take notice of the two little bugs enjoying the action. This somewhat more sedate tea party has an autumnal look to me. All the earthtones and the very confined area of the composition suggest everyone has squished up inside to be cozy. I imagine this party is quite loud, with everyone talking at once. Rabbit seems to be wondering if the tea supply is going to run out and I really don’t fancy the way Cat is eyeing poor Squirrel who just wants to eat his jam tart in peace. 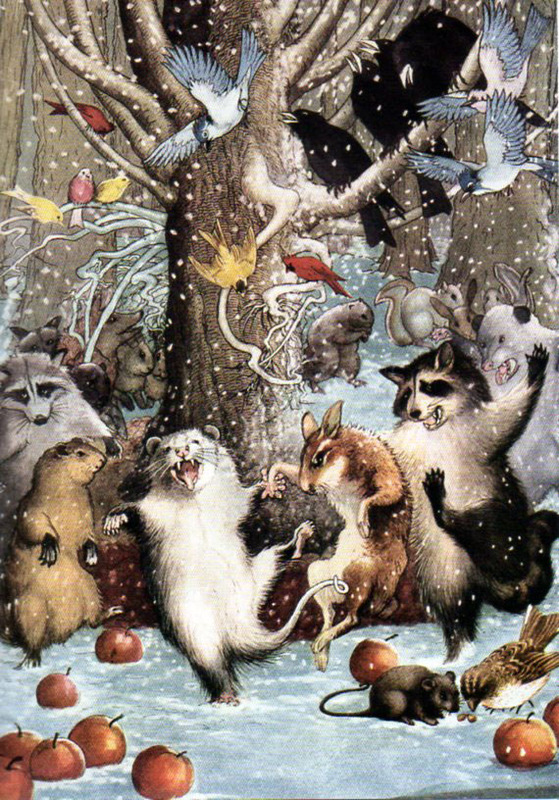 Lastly here is a bunch of wild, crazy animals having an outdoor winter free-for-all festival. Obviously too much scrumpy has been consumed, and in a rather short time span. Look at the raccoon at the far left (behind the woodchuck); by the look of him he’s drawn the short straw to have to get Possum home safely. Today being another in a succession of gloomy gray days I decided to post something bright and cheerful. 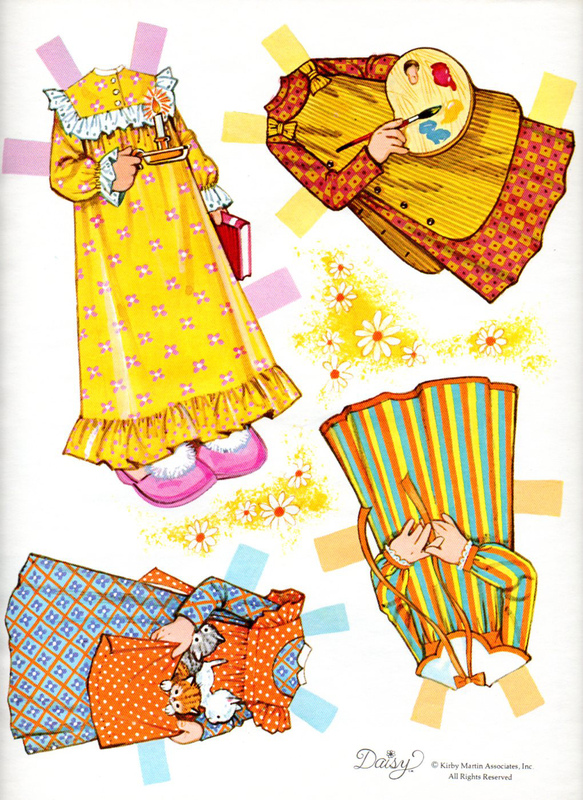 Daisy is from the late 1970s and is, as will become incredibly obvious, a Holly Hobbie clone. 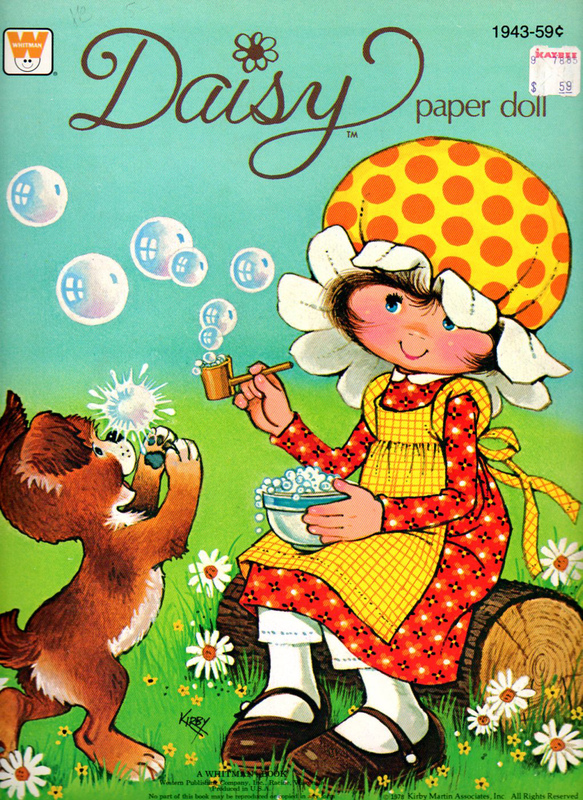 Well, not a clone exactly as Daisy (the doll) has her own rather distinctive look. 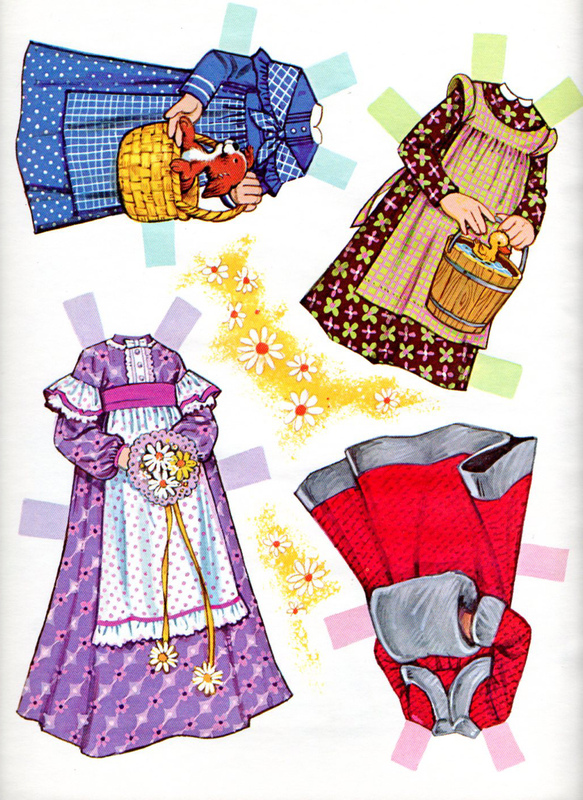 But clone-ish in that she has that same prairie-style look to her wardrobe. She’s really kind of sweet even with her rather oversize head. Actually I think her large noggin makes her especially sweet. 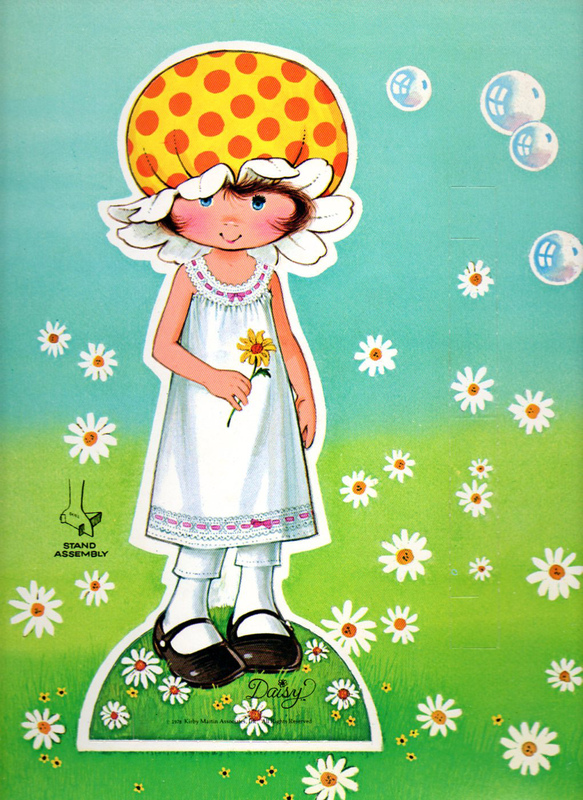 Though it does make me wonder, how much of her head is hat and not head at all. Love the artist smock with the button-up sides. 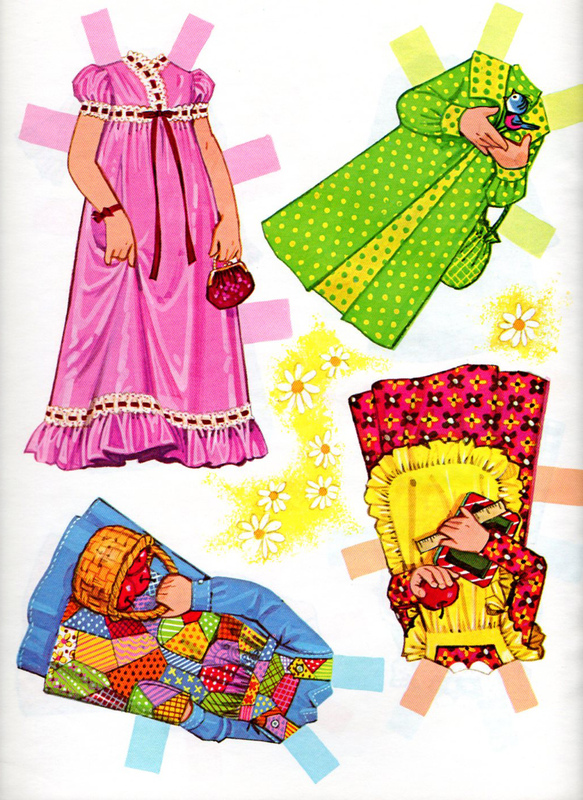 There’s the very obvious Holly Hobbie patchwork pinafore over a blue dress. And a warm coat; it may be a gray day, but baby it’s cooold outside! I was reading the new issue of Hi-Fructose (vol. 18) over the weekend, specifically I was reading the interview with Ray Caesar and was shaken by the intense, deeply honest things that he said. Things about both his life (which hasn’t been anything remotely resembling a picnic*) and about his work.“Think of my pictures as a sanctuary where one can take out a small piece of pain and allow it to be free.” Giving this interview in such a truthful way is the act of a very courageous person. Kudos, Ray! 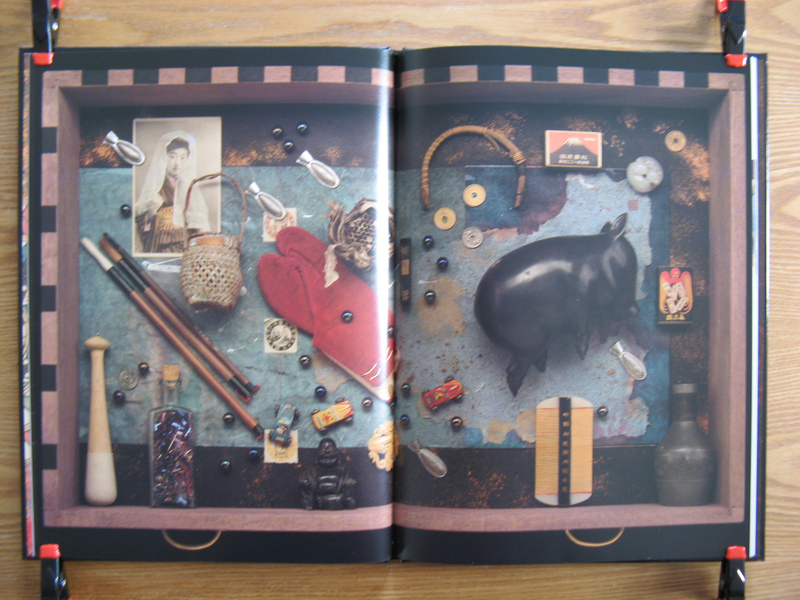 One of the more poignant practices that Ray incorporates into his work are hidden images or objects. Actually, literally hidden, as in tucked away in a box or a drawer. For those of you who aren’t familiar with his stunning images; Ray works in 3-D software, creating the components of his paintings in a virtual world. And he likes to hide things in that virtual world that are, technically speaking, not there in the final printed image. 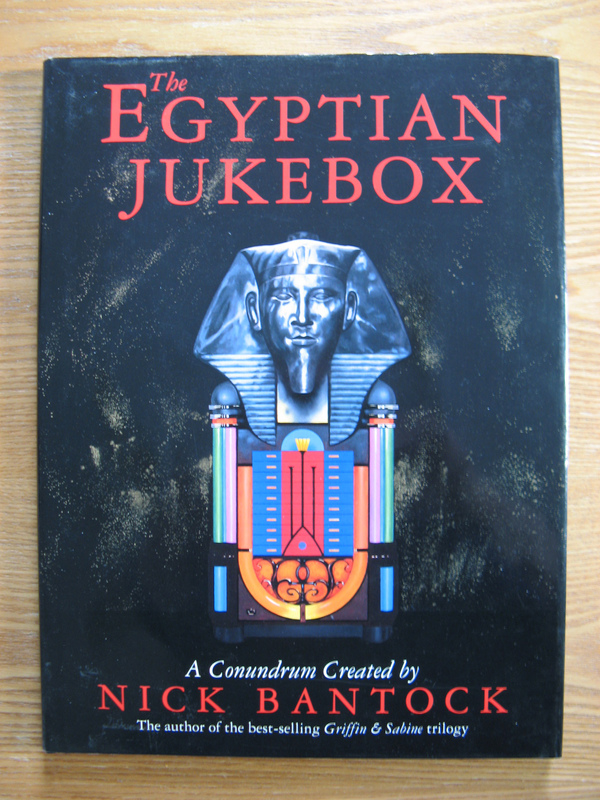 The Egyptian Jukebox by Nick Bantock. 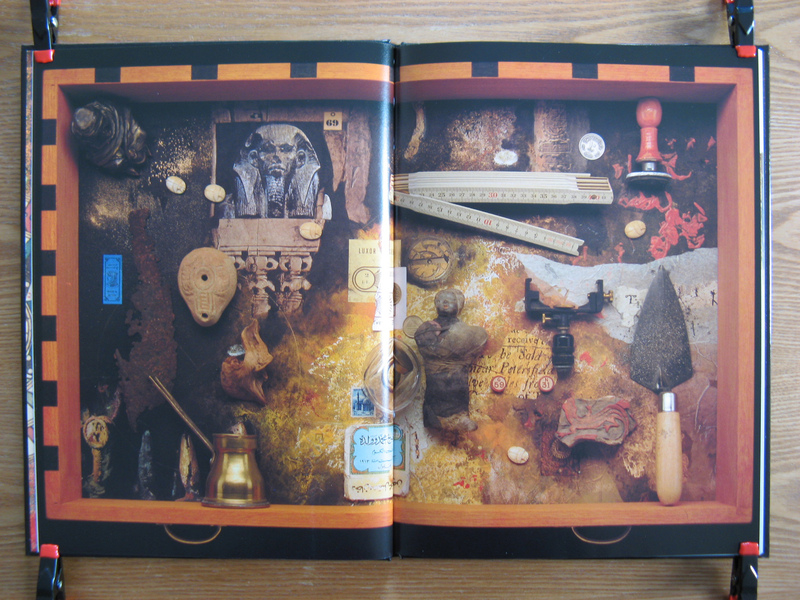 This particular Bantock volume is about a museum cabinet of drawers configured as a jukebox. 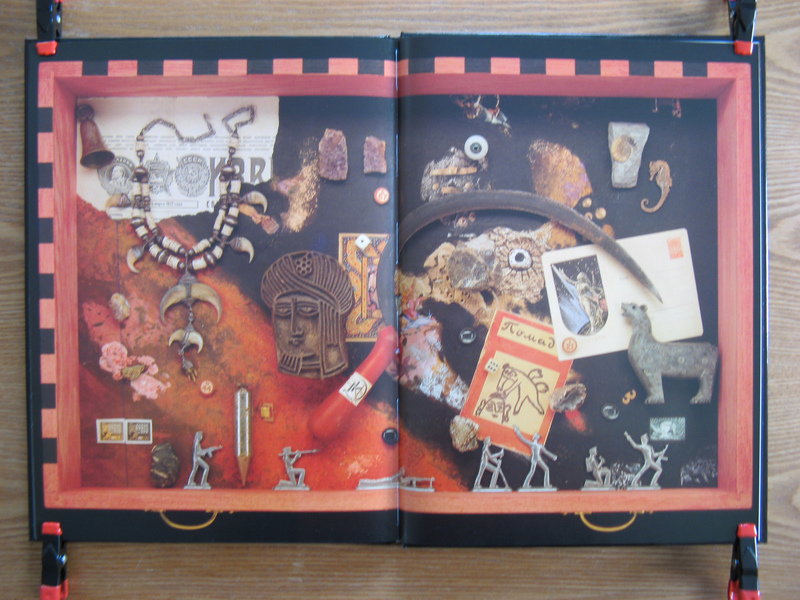 It has ten drawers each filled with objects and accompanied by a clue. 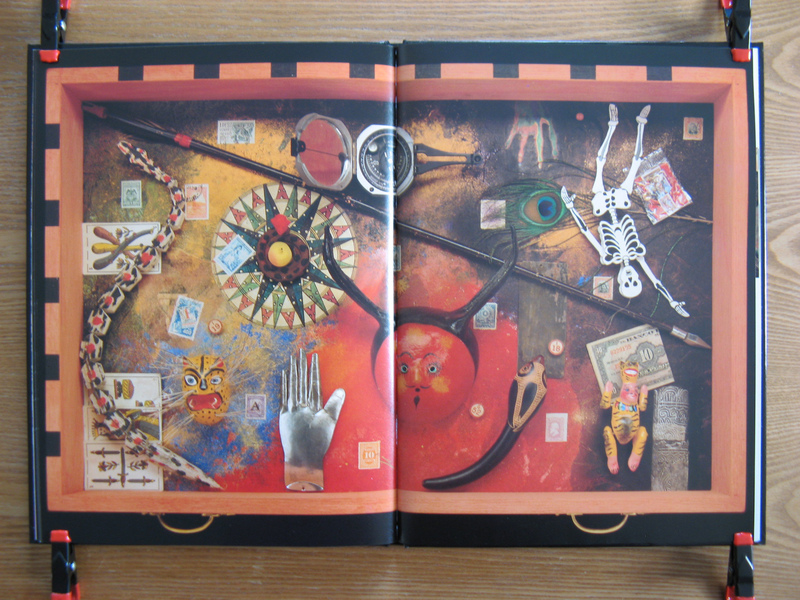 The story of the jukebox and solving the contained riddle are quintessential Nick Bantock. In a very real way we are all like a cabinet of drawers, the content and configuration of objects determined by who we are, what we have done. . . what we are going about doing. I have often thought it would be lovely fun to make one of these museum cabinets or collectors boxes in an actual real world, hold-it-in-your-hands, be able to touch and contemplate it way. Choosing/creating each object for it’s texture, it’s color, it’s size; all to reflect the character for whom the box is being made. There exists an entirely human fascination/dread of that which is hidden, that is concealed in layer within layer of drawers and boxes. Is it delicate and beautiful? I seldom do delicate but I have done a certain amount of beauty. I’ll leave the oozing to others (at least for the moment). I make no promises whatever about biting. *Not the sort of picnic that anyone (outside of a horror film) would actually even think wanting to attend. I got this for Christmas. . . from my husband; it’s cheaper than therapy. Truthfully, I really needed this DVD, it keeps me sane. OK you can stop laughing now, really, I mean it, seriously. . . stop laughing. Here’s the thing: I find this documentary about Harlan Ellison massively, well, comforting. Yes, I said comforting and if you don’t bloody stop laughing I’m going to have to bash you quite painfully hard. . . repeatedly. So you’re wondering how on Earth I could find an hour and a half documentary about a rage-filled, hair-triggered, somewhat subversive man comforting, even therapeutic, read on. I know exactly how a burning cold boulder of anger and annoyance feels lodged inside your chest. I know exactly how maddening it is to be surrounded by stupid people, or worse; people who insist on treating me like I’m stupid. 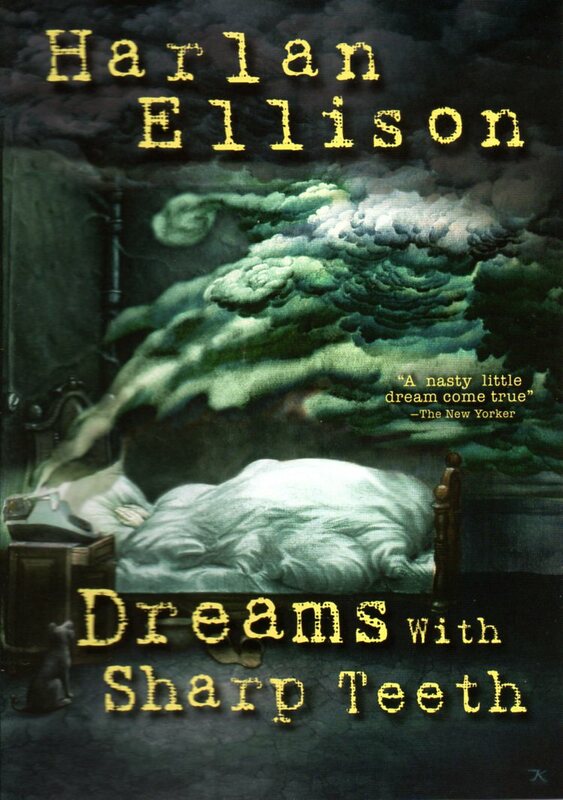 And it doesn’t half hurt that Harlan Ellison is one of the most brilliant and eloquent writers I’ve ever read. Whose work can make me laugh out loud or weep. Whose books I reread over and over. And I read a lot, really a lot; as many as three to five books a week so I have a broad platform for comparison. Yes, I’m a highly intelligent, well-read, very creative individual with intensely diverse interests who insists on being true to the best of who I am. The Devil take the consequences. This film is valuable and deeply important and I am grateful to have the opportunity to watch it whenever I need reminding that I Matter. My work Matters. So go buy this film (or at least rent it). Go Buy everything Harlan wrote (or edited) that you can lay hands on. Why are you still here? Go find his stuff, I swear that you will not regret it. Well, maybe a few of you will but you’ll still be better for having experienced him. Sidebar: For those of you who have never met me and think from the previous content of this blog that I’m a fairly sweet, light-hearted bundle of goodness and light: Sorry; as it happens that’s not entirely the case. There is for good or bad a more than middling slice of darkness within me; which is kind of a good thing actually as it makes me far more interesting. And has resulted in my getting interesting nicknames like “Darth Velner”. Still in the end, I, like the planet Earth am classified “mostly harmless”, so no worries.